NewRootsNews.org and Studio@620 partner to find The Next Great Play with a playwriting competition. The grand prize winner will receive the world premiere of their play as part of the Studio@620’s 2012-13 theater season. The top three submissions will receive staged readings open to the public at Studio@620, from which a winner will be chosen. The chosen playwright will win the fully realized world premiere of their play, as well as receiving the Studio@620’s standard playwriting fee. All plays must be original works that have not been publicly produced or performed, although past public readings are acceptable. Submissions must be at least one act long and can be any genre, including musicals, and about any subject matter. Submissions will be accepted through Nov. 25. All scripts must include a cover page with the title of the play and contact information, a 1-2 paragraph synopsis, a character breakdown and a $20 check or money order made out to New Roots News to pay the readers fee. Submissions should be mailed to: New Roots News, Attn: Next Great Play, 622 1st Ave S, Suite 4, St. Petersburg, FL., 33701. Digital submissions can be made at: nextgreatplay@newrootsnews.org ($20 check or money order needs to be mailed New Roots News at the above address). NewRootsNews.org is the premiere online repository for all things St. Petersburg. Their passionate and driven team of young professionals covers arts, events, lifestyle, music and local government, as well as profile local businesses and citizens. Founded on the values of public journalism, NewRootsNews.org is contributor-based and always looking for other members of the community to get involved. ECWC Alum Jack Vanek has been very busy! Hektoen International Journal – “Always, Autumn Leaves” under the heading Facing Death and “Balloons” under the heading When Children Die . The Examined Life Literary Journal – “Guillain-Barre” and “Vanishing Twin” (forthcoming in November 2011 print issue). Each November, the Miami International Book Fair brings some of the greatest stories ever told to South Florida. Now we want to hear your story. Introducing the “South Florida Flash” writing contest. WLRN-Miami Herald News wants brief stories that linger in the mind. Very brief. As in 305 words or less — “3-0-5” being at one time the area code for the entire state of Florida. Submissions can be fiction or non-fiction, poetic prose or prosaic poetry — the creative sky’s the limit! Every day leading up to the book fair, we’ll read some of your South Florida Flash pieces on air at WLRN 91.3 FM and publish them online at miamiherald.com/wlrncontest. Fill out the form below and hit submit. By participating in the contest, you become part of the Public Insight Network, which allows you to inform Miami Herald and WLRN stories through your insights. To learn more about your membership perks, visit miamiherald.com/insight. -Entries must be 305 words or less. -Entries can be in English, Spanish, or Creole, or some combination thereof. -To be considered for the contest, the entry must be received by 6pm, Sunday, November 13, 2011. -Employees of WLRN and the Miami Herald are not eligible. Sunday, November 13, 2011, at 6 pm. A very special guest literary judge (no, we don’t know who yet) will pick the winner. The grand-prize winner will get a grab bag of goodies during a dinner with Christine DiMattei, afternoon anchor of WLRN-Miami Herald News. Four (4) runners-up will receive a copy of Tigertail, A South Florida Annual: Florida Flash, edited by Lynne Barrett and published by Tigertail Productions, and “Miami Stories: Volume One,” a live hour of true stories from WLRN Under the Sun and Lip Service. ALSO, check out the audio link promoting this contest –WLRN-Miami Herald News Anchor gets “Flashed”! and enjoy the sample submission taken from Tigertail, A South Florida Annual (Edited by Lynne Barrett, one of the many talented writing professors at Florida International University) by Writers in Paradise Alumna, Diane Mooney. Mooney’s poem, “July in Ft. Lauderdale” is read about 3/4 of the way through the piece. Enjoy! ECWC Alumna, Sanderia Faye (Smith), has been accepted, and is currently attending the Martha’s Vineyard Writers Residency. 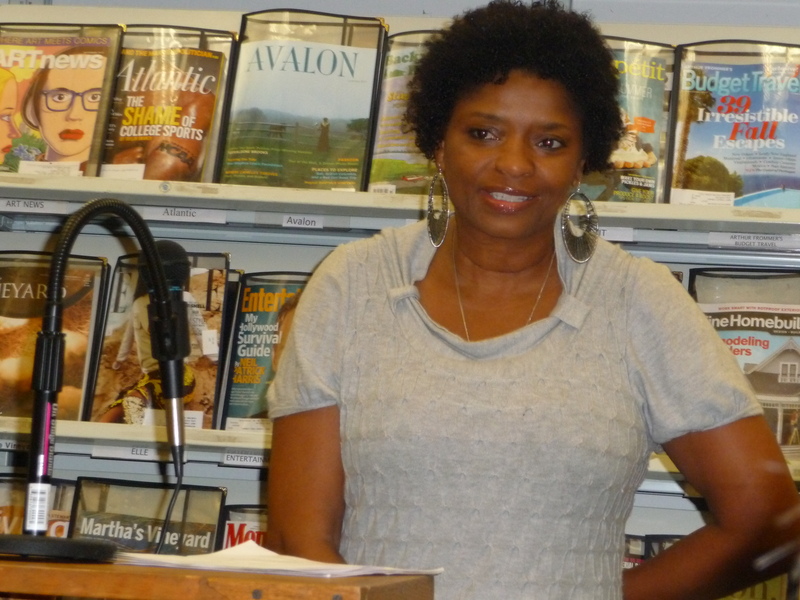 As part of the residency, Sanderia read from her work in progress at the West Tisbury Library in West Tisbury, MA on Thursday, September 29, 2011. Sanderia’s work was also selected for “Best Of” honors at the 2011 Eckerd College Writers’ Conference (Writing the Middle Novel Workshop) and an excerpt of her work will appear in the forthcoming SABAL. You are currently browsing the Writers in Paradise Alumni blog archives for October, 2011.